Galileo Galilei Biography Worksheet – Download our great free printables for science for kids. This fun biography worksheet includes a word search game and a hidden words puzzle. Our free printable for science worksheet teaches kids fun facts about Galileo Galilei. You can download this science for kids worksheet for free and are free to print the science worksheet as many times as you need. Preschool kids can enjoy the free printable science worksheet as a listening comprehension tool. Young kids who cannot read can use the missing word seek game to recognize letters and words and learn inspiring information about Galileo Galilei Biography. Teachers and Educators can use our free printables for science classes, after school enrichment programs and special education programs. Parents can use our free printables for homeschooling kids and to spend quality fun time with their kids at home. Our free science kids site offers many free to print word search games, free hidden words puzzles and free printables for science for kids. Who was Galileo? Galileo Galilei was the father of modern physics, father of modern science, and father of modern observational astronomy. What was his greatest contribution to the world? Did Galileo have any children? Learn more fun facts about Galileo Galilei by downloading the Galileo Galilei Biography worksheet! [sociallocker]Download free printable for science worksheet about Galileo Galilei. Download FREE Galileo Galilei Biography Worksheet for Kids! 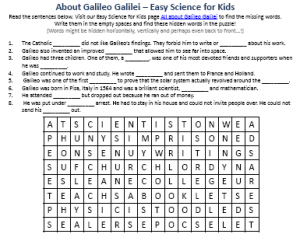 Liked the FREE Galileo Galilei Biography Worksheet? Read lengthy information about Galileo here. Declan, Tobin. " Galileo Galilei Biography Worksheet - Free Printables for Science for Kids - ." Easy Science for Kids, Apr 2019. Web. 23 Apr 2019. < https://easyscienceforkids.com/galileo-galilei-biography-worksheet-free-printables-for-science-for-kids/ >.